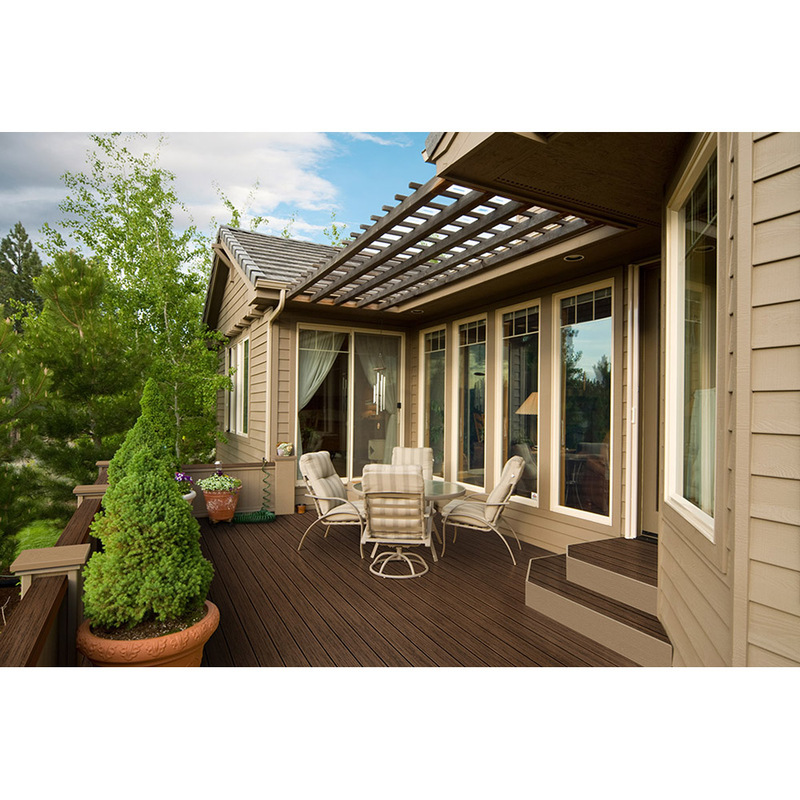 Hoover Fence Co. is proud of our extensive offerings for Porch and Deck construction and renovation. 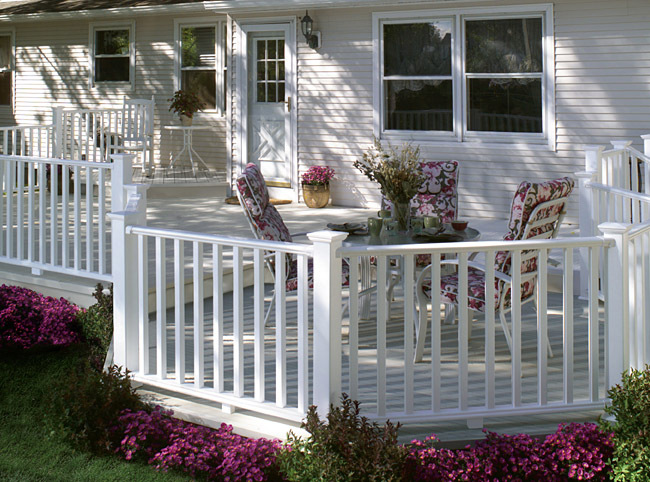 Offerings include Aluminum and Vinyl Railings, Secondary Handrail Systems, Vinyl and Aluminum Porch Posts, and PVC Decking. 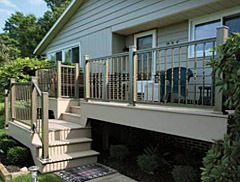 Hoover Fence Company offers some of the best vinyl railing systems available. 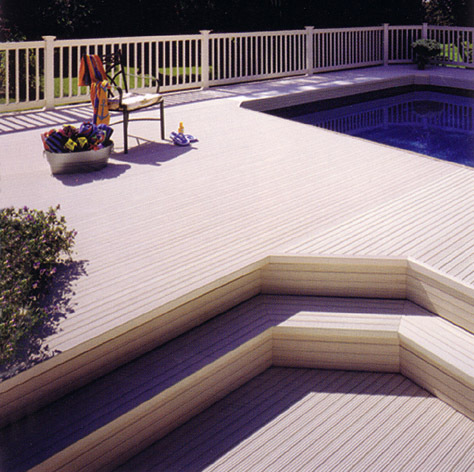 We provide quality products made by Superior Plastic Products™, designing vinyl products for over 20 years. 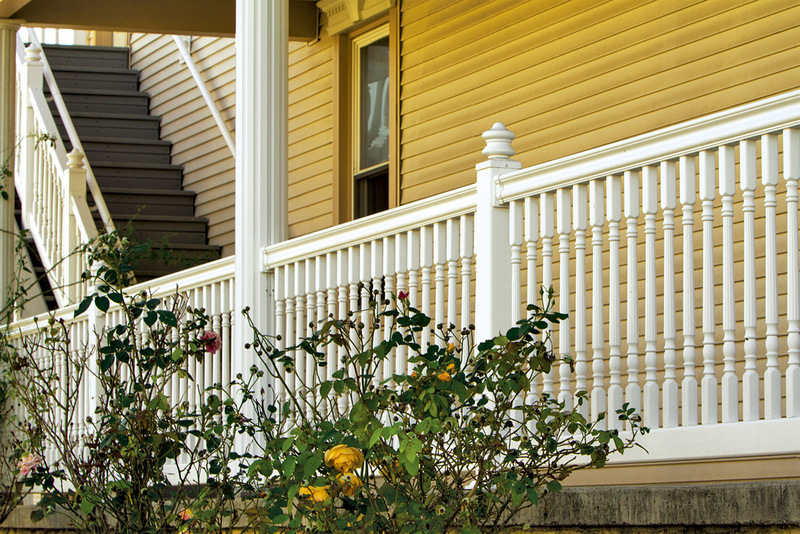 The Superior Plastic Products styles are available with matching balusters, newel posts, and porch posts. 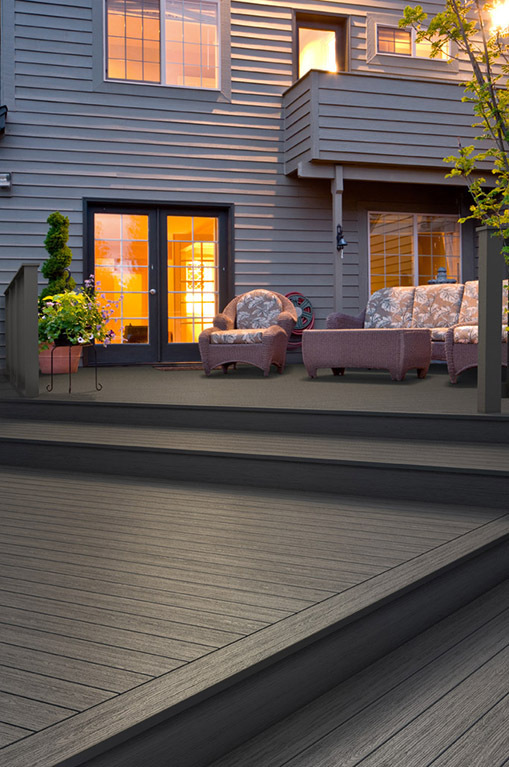 We also offer vinyl railing systems manufactured by EverNew®, a division of Certainteed™, a building materials manufacturer for over 100 years. 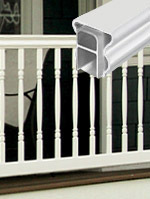 All of our vinyl railing is backed by a manufacturer's lifetime warranty. Choose a style of vinyl railing with confidence that you are purchasing quality materials unsurpassed by products offered by your local home improvement center. These railing systems are made for professionals who demand the best. 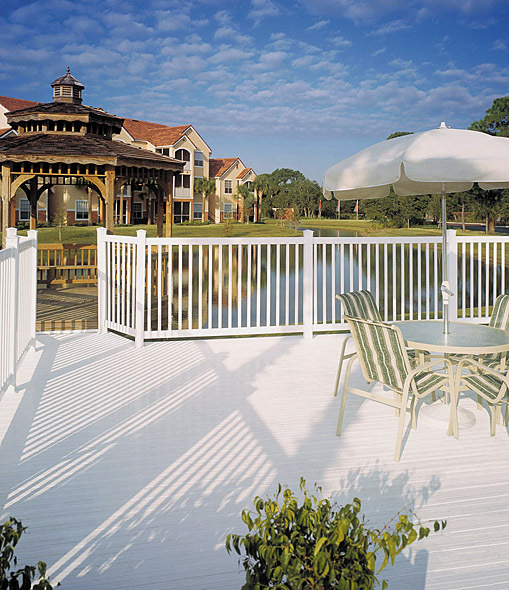 Hoover Fence Company offers quality Key-Link™ aluminum railing systems. 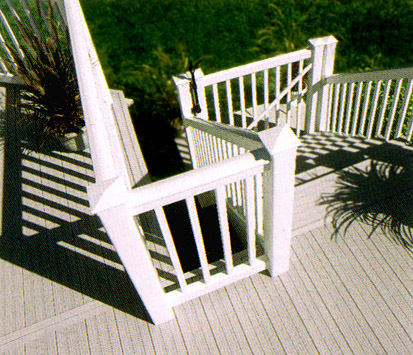 These railing systems can be used for residential or commercial applications. Included are porch posts and columns, structural posts to support the weight of the roof above the porch. 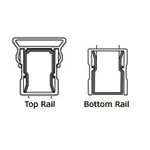 Handrails are also available to be used by themselves or as secondary handrails attached to your railing. All systems come with a manufacturer's limited warranty. 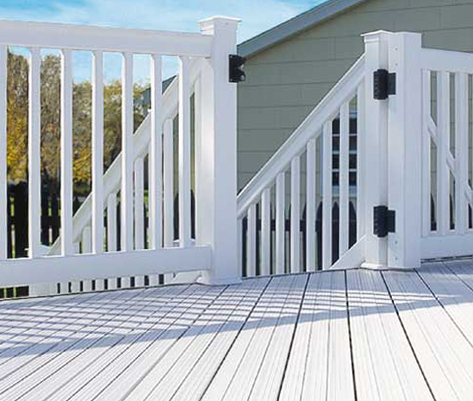 Many styles available with choice of rails and pickets. Section comes broken down in a box. 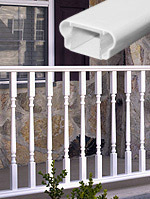 Pickets slip into PVC insert in rails for a tight quiet and screwless assembly. Designed to satisfy secondary handrail requirements that require a continuous 1-piece handrail. Vinyl handrail has aluminum insert for strength. 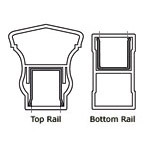 When attached to railing, handrail is installed to be 2" below the top of the railing. 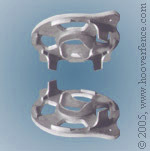 Can also be used "stand alone", attached to wall or posts without railing. This product has the same integrity in fabrication and good looks as our other 100% vinyl products. Easy to assemble component system comes with installation instructions. 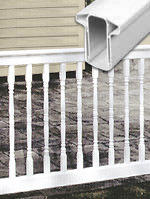 Use with any of our vinyl railing systems. Be sure to check your local building codes before ordering. 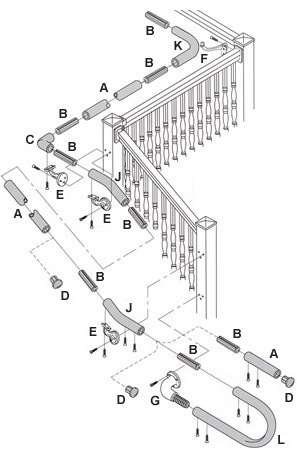 Codes may vary on shapes and styles of handrail. Note: 1-1/2" Commercial complies with ADA codes. Key-Link ADA Aluminum Handrail features a 1-1/2" round rail that is typically used as secondary railing but can also be used standalone. 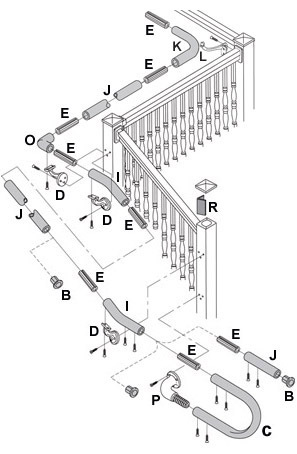 This system is component driven so multiple parts and pieces are typically required. Load Tested To Exceed IBC Specifications. 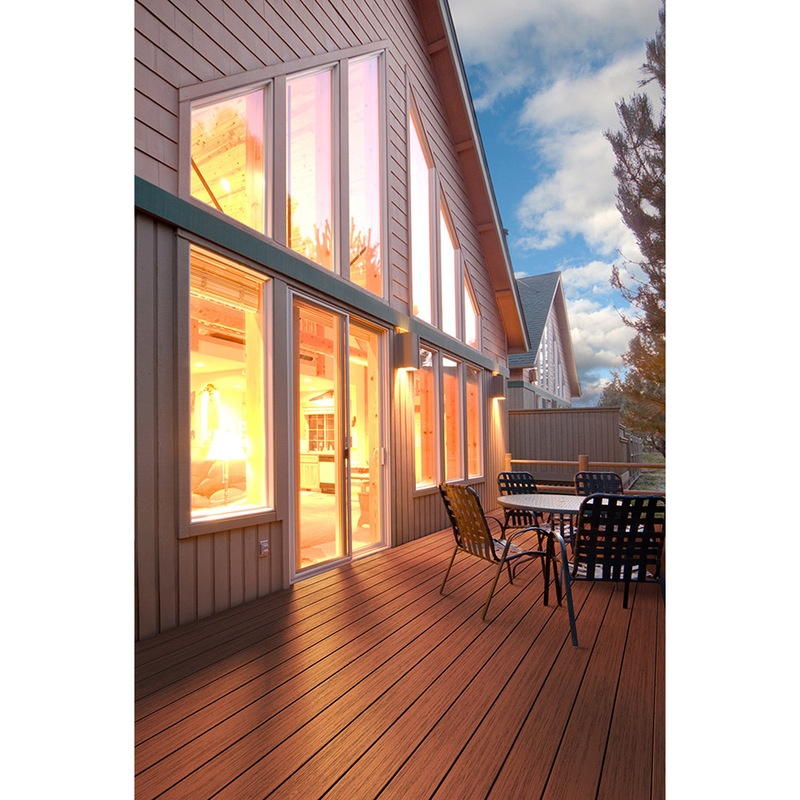 Can be Used for Both Commercial and Residential Applications. 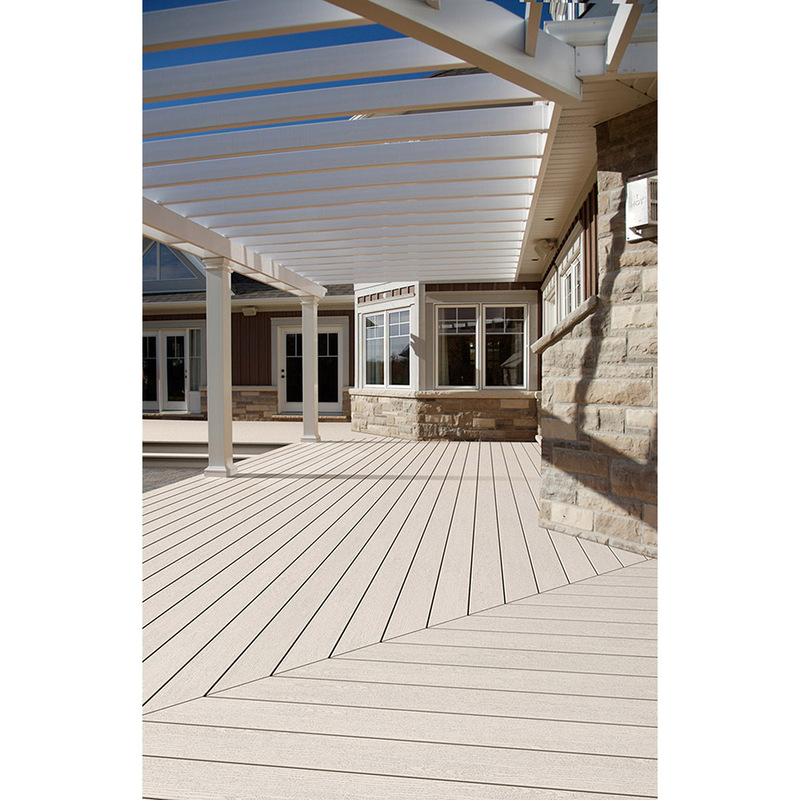 Note: Key-Link Aluminum Products meet or exceed the building code requirements of the International Building Code. Always check your local codes before purchasing. 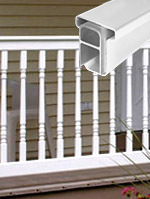 Vinyl Structural Porch Posts are strengthened by using an aluminum round extrusion with recycled plastic supports inside the posts. Available in eight styles in 4", 5" and 6" post sizes. 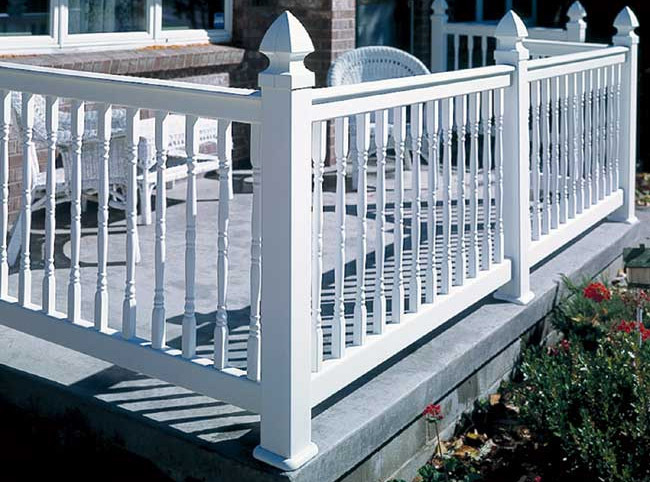 High weight capacity makes these porch posts suitable for nearly all applications. 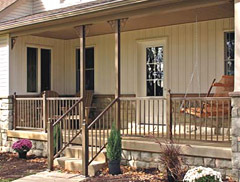 Porch posts are available in a variety of colors to match our vinyl railing styles. Round Columns are 100% vinyl with extruded aluminum interior support. Columns are manufactured in 9' and 10' lengths for most styles. 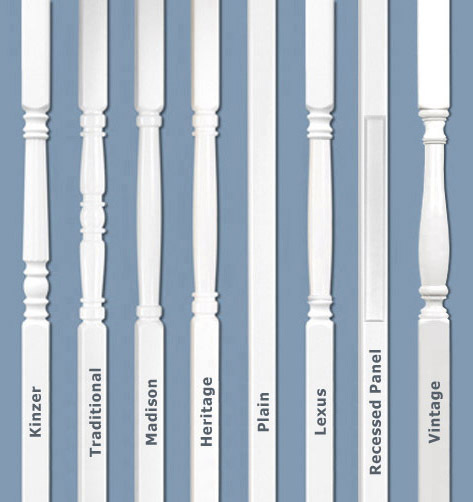 Columns are tapered except for a straight style available in the 8" round 9' length. 10' length columns are available in white, almond, and clay. 9' length columns available in white only. Colors match our EverNew and Superior Railing. 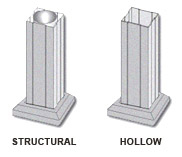 These columns are all structural and easy to install as well (guidelines are included). Each unit comes complete with top and bottom plates. Top, middle and bottom trim sets are sold separately. Square Columns are 100% vinyl with extruded aluminum interior support. Square columns are manufactured in 9' and 10' lengths. 8"x 9' square columns are available in white only. The 8"x 10' square columns are available in white, almond, and clay. The Savannah post comes in white and clay only at this time. Colors match our EverNew and Superior Railing. These columns are all structural and easy to install as well (guidelines are included). Each unit comes complete with top and bottom plates. Top, middle and bottom trim is included with the Savannah column. The 3-piece trim set for the 8" square column is sold separately. Key-Link Aluminum Porch Posts are perfect to improve the appearance of your house whether you need structural or hollow posts. 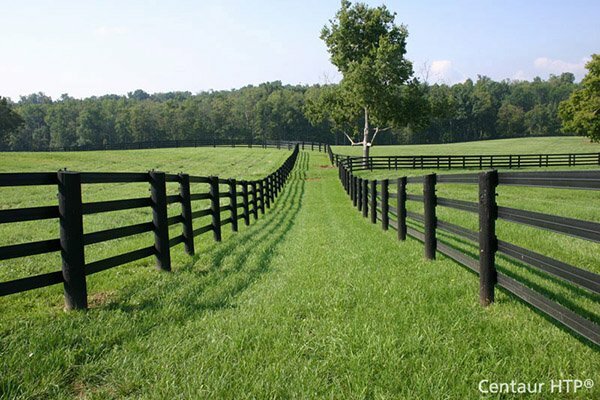 Installation is easy and the posts are maintenance free. 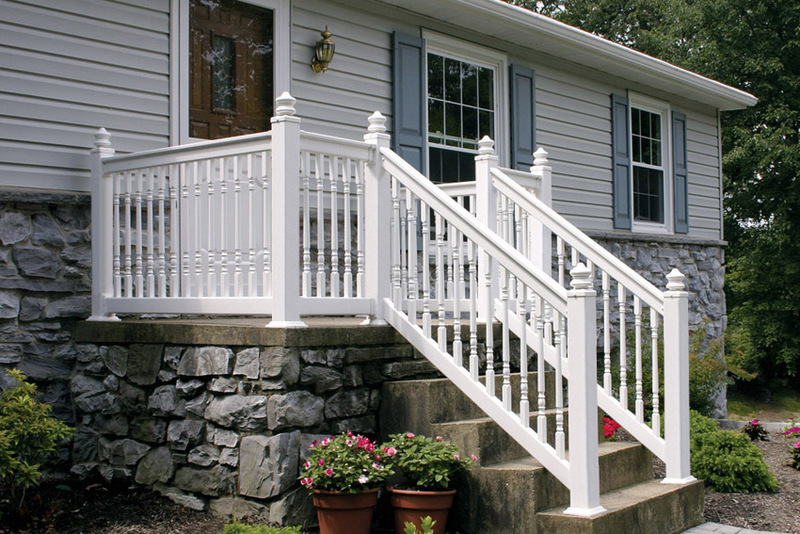 More homeowners are choosing aluminum posts for this reason over other choices on the market. 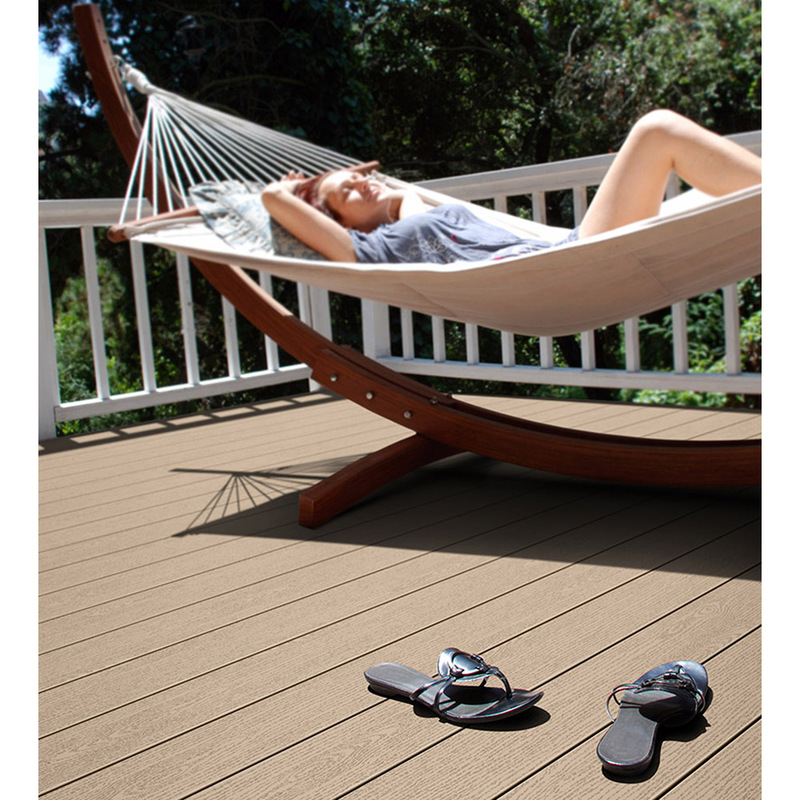 The EverNew® Contemporary Vinyl Deck is a smart alternative to the traditional high maintenance wood deck. 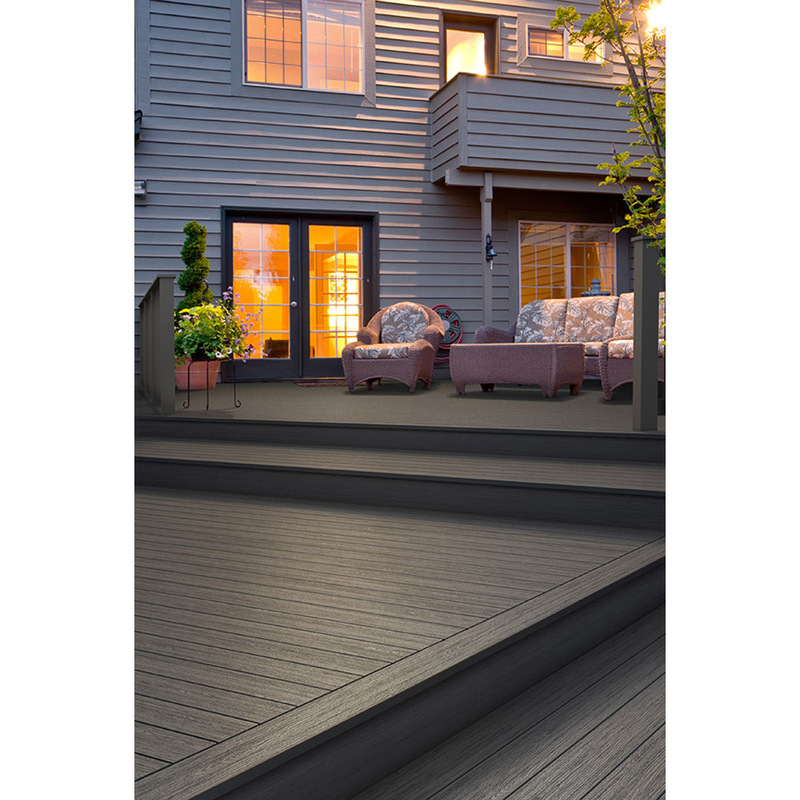 The innovative slip resistant deck surface is non-splintering while providing the safety benefits of no nails or sharp edges. 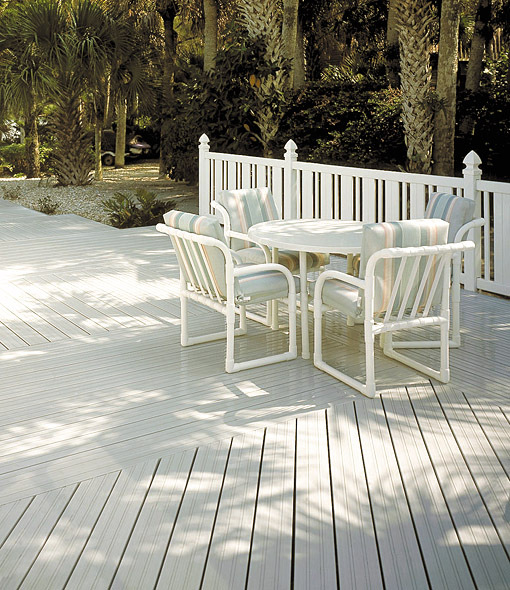 PVC decking offers durability, longevity, and beauty that will outlast most other types of decking products. Environmentally safe, recyclable and non-toxic, our virtually maintenance-free vinyl systems have excellent weathering properties. 1. Line up deck planks and screw into place, similar to a wood plank. 2. Snap deck fill pieces into place. Fill pieces even out the surface while concealing the screws. 3. Slip deck end covers over exposed deck plank ends. 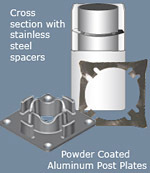 End covers provide a smooth, finished edge. For an additional finishing touch, fascia boards are available to 'hide' joists. 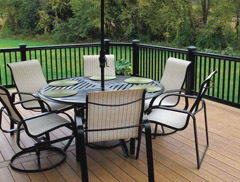 Existing deck substructures may be of sufficient strength and in sound enough condition to enable replacement of worn wood boards with vinyl planks. UNIQUE TWO COLOR COMBINATION BOARDS ADD FREEDOM OF DESIGN! 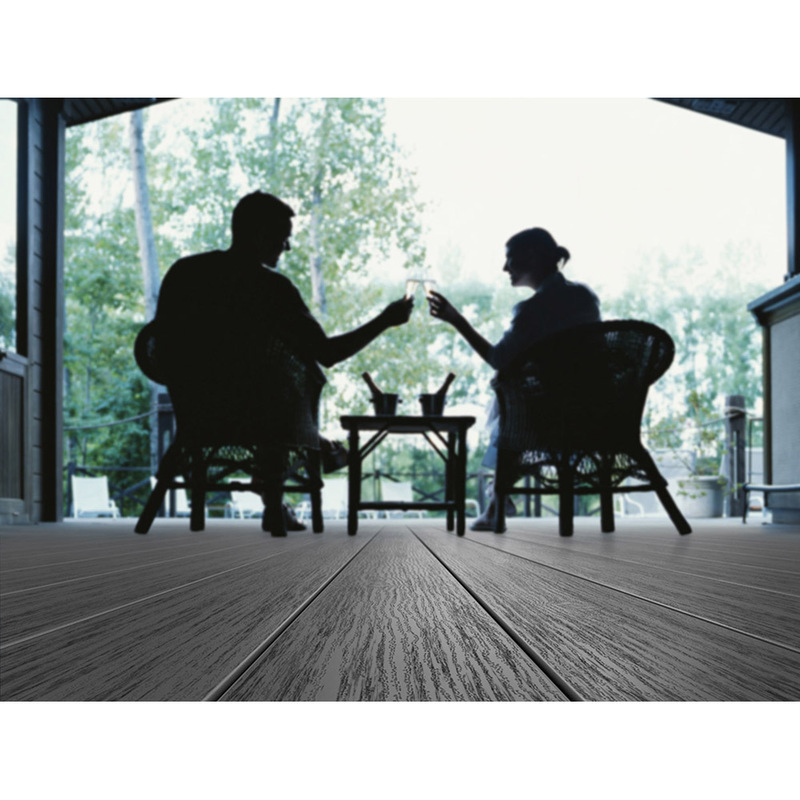 Clubhouse® (formerly Solstice®) Decking has a proprietary formulation that creates a strong, dense cell structure with the finest protective cap stock in the industry for incredible results. Superior strength, 20% stronger than the leading competitor. Comes with a manufacturer's limited lifetime warranty with 25-years fade and stain coverage. 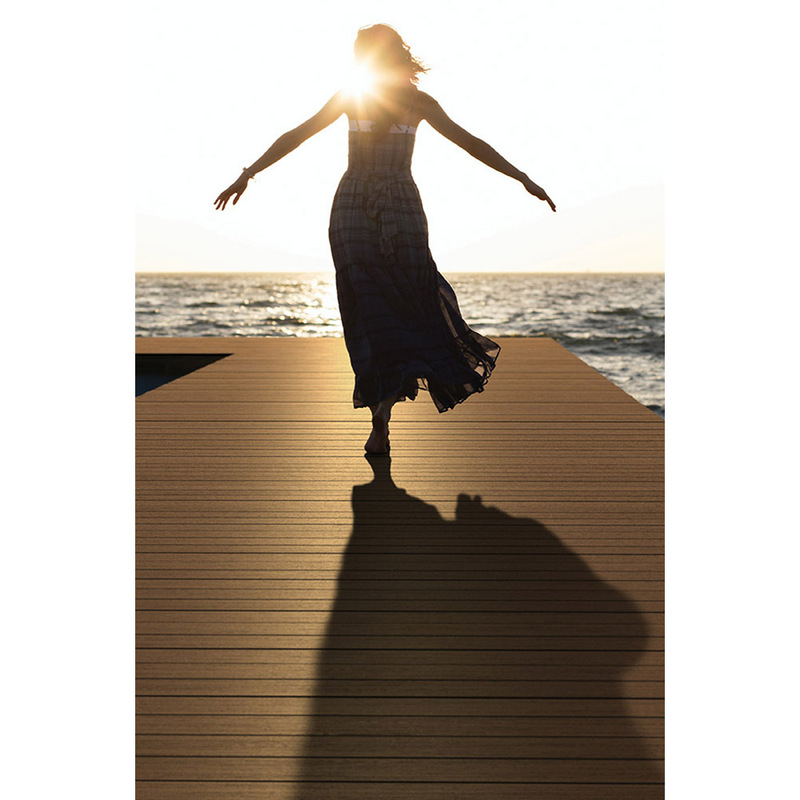 In the brightest sunshine or in the coolest shade, Clubhouse makes a statement with an exceptional natural wood look with deep grain embossing, in two stunning collections. 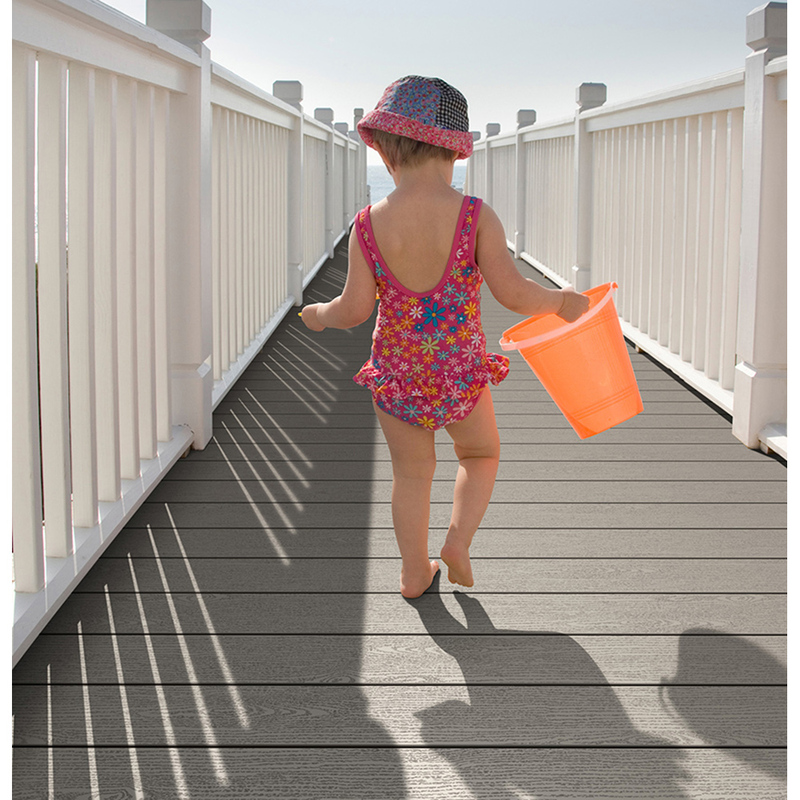 The dual-color, dual embossed planks provide multiple design options with one board! The stunning natural woodgrain and finishes will look beautiful for years to come. 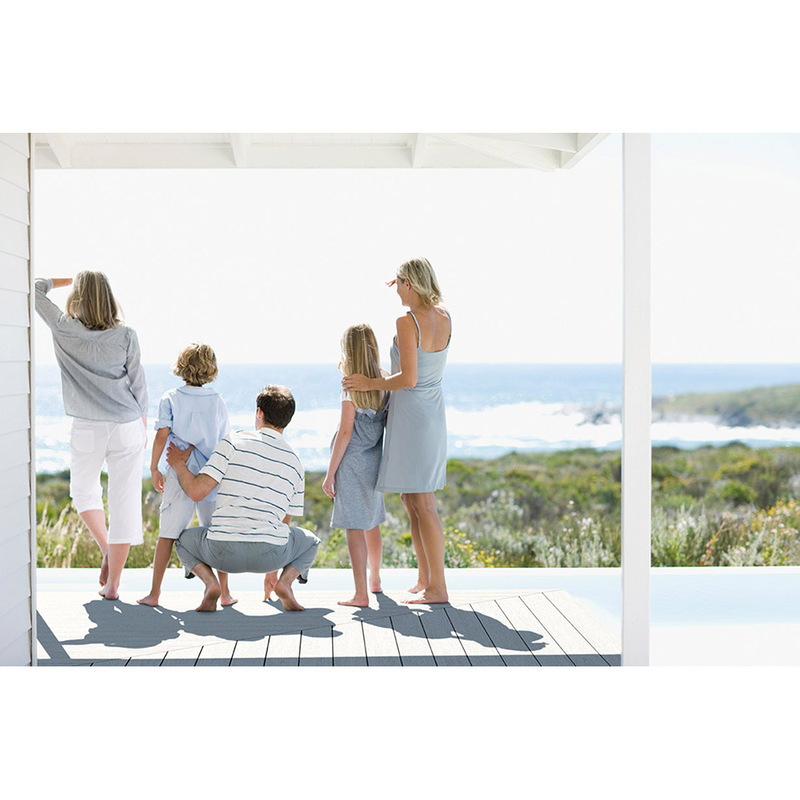 With Korelite™ and SunShield® technology, the result is a handsome hardworking addition to any home that will withstand the harsh effects of any climate and retain color and grain. And it always cleans up easily with common household cleaners. 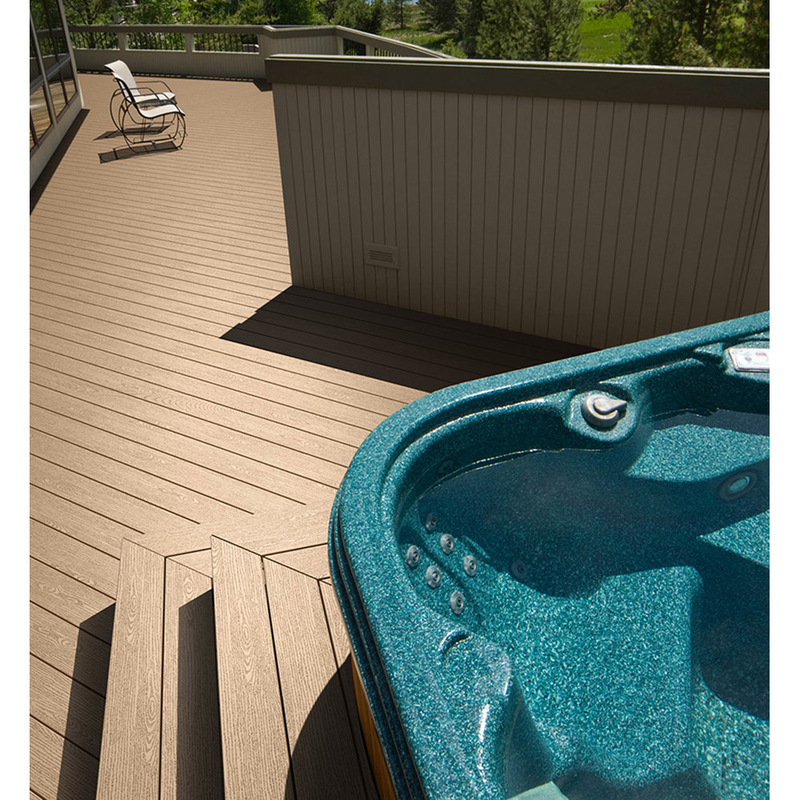 With Clubhouse Decking you have flexibility no other decking can offer!